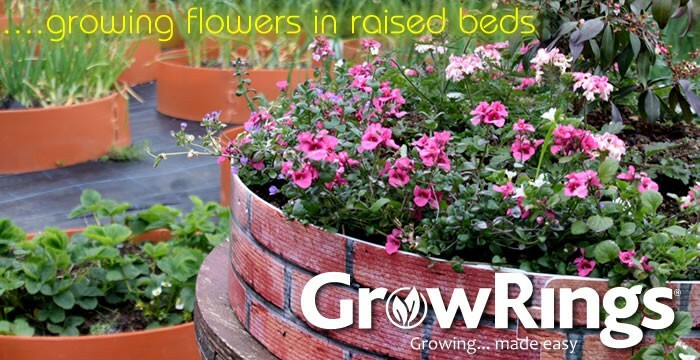 GrowRings are ideal for displaying bedding flowers, bulbs and herbs on lawns, patios or driveways. The beds are circular but can be simply creased and bent to form semicircles, quadrants and other shapes to create opportunities for brilliant colour. They can be used to disguise garden obstructions like utility poles and seldom used manholes. Choose a suitable site for the GrowRing. Open and sunny but sheltered from strong winds. Make a colour plan to your preference. Thinking of colour balance and the size of your plants. Keep taller plants to the centre of the ring and smaller varieties towards the edge. Your Garden Center will have a stock of plants and will be able to advise you of what is coming in shortly, so plan ahead. Most garden centre’s have a book stall, where you can get more information and there are plenty of good magazines with up to the minute seasonal advice. If you plan on planting an array of similar size plants, you can increase their visibility by building up the soil towards the centre of the ring, creating a dome effect. Displays with Pendant Plants overhanging the edge of the GrowRing can be very attractive. These can be particularly effective with some of the shaped beds you can make with GrowRings for against a wall. Drainage is greatly improved for plants with roots susceptible to moisture damage. In a Family Garden there are Children, Animals and Balls among other daily hazards for flowers. These do not tend to run over the top of the Ring as it is significantly higher than surface beds. If using on an impervious surface like a patio utilise 1m x 1m sheet of weed fabric inside to trap the soil. This is also useful on a grass site if you are concerned about heavy weeds. If the Growring is on Grass use 4 inches of bark chippings around the edge to suppress grass growth. GrowRings Window Boxes make super display containers for both apartment and house dwellers, brilliant for both indoor and outside planting of flowers, salads and herbs .